Diana, Princess of Wales, would have turned 53 on July 1, had she survived the car crash in Paris in 1997 that took her life at just 36. 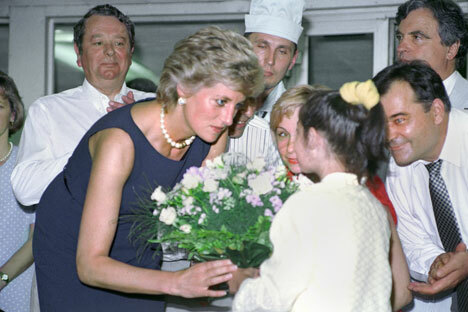 Diana visited Moscow for the only time in June 1995. RBTH recalls the visit and marks the anniversary of her birth by asking how Russians viewed the mother of Britain’s future king. Vladimir Mashanin was the only press photographer allowed to take pictures of Diana at Tushinskaya hospital in Moscow, as he recalls in an article in Novie Izvestiya. She went to the children’s hospital, which her charitable work had previously supplied with medical equipment, and then to Primary School 751 where she opened a branch of the “Waverly House” relief fund for assistance to disabled children. Later on June 16, Diana was presented with the Leonardo Award in the Russian capital. Mashanin remembers her as a tall and very charming woman: “For me, as a photographer, it was a great pleasure to meet the eyes of Diana while she was greeting the nurses, dreaming about eye contact with the Princess.” All the formal rituals of the meeting in the hospital were broken, says Mashanin: at the entrance to the hospital, a small guy interrupted the official procession to seek an autograph, Diana didn’t meet any of the heads of the hospital, but stayed longer with the kids, played with them on her knees and “still lady Diana was higher than anyone,” says Vladimir. Russians are quite familiar with the Princess of Wales’s life story, especially those who remember the morning newspaper headlines on September 1 1997, the day after her car crashed in Paris. The leading Russian newspaper Kommersant compared the death of the nation’s favourite, and a beautiful woman, with the murder of President Kennedy, saying that Diana was loved by both public and press. Group members say that for most of them Princess Diana seemed “like a light in the darkness” and they will never forget her. A great number of books, songs and films have been dedicated to Princess Diana in Russia. Rock-band Akvarium (Aquarium) which is well-known for reflecting the situation in the world in their work, responded to Diana’s death by dedicating the song 4D (Last day of August) to her. The song described in a metaphoric way the catastrophe in Paris in lines such as “she spent more than you can dream, // She gave up everything”. The leader of the band later told an interviewer at Radio Svoboda that “this album is dedicated to the sacredness of women and all the songs are about that or about what's going on if there is no woman.” The song 4D fitted the last description, the woman had gone and “from now on, her blood will clean mildew, // The white colour of the first day of September”. Although the Princess of Wales was at the centre of many scandals connected with her cheating husband Prince Charles, or with other problems in the royal family, and despite the fact that she was a favourite cover story for the yellow press, which followed every detail of her life, many Russians simply remember her as the Queen of Hearts.